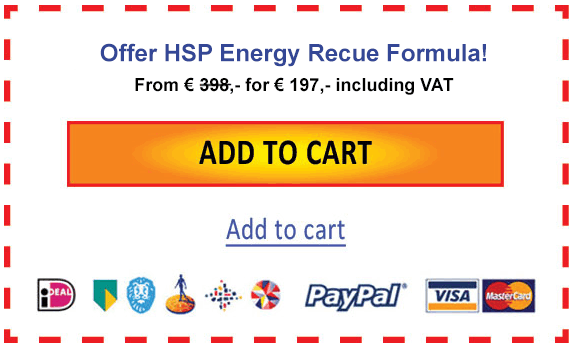 The HSP Energy Rescue Formula Module contains all the tools any HSP needs to protect and restore their energy, reduce their stress level and master their emotions. * You are easily overstimulated and more often than not this leaves you feeling drained and exhausted at the end of the day. * You are often not sure why you are feeling what you are feeling and this leaves you feeling confused and/or not like yourself. * You have problems setting and guarding your boundaries and you worry about what others think of you. * You are suddenly overcome by emotions that you can't explain and/or after talking to that friend in need you feel completly drained. * You are easily overwhelmd by loud noises, big crowds, bright lights, strong smells and this might even prevent you from doing everything you want to do. * You are so busy taking care of everybody else, that you tend to forget to take really good care of yourself. You will learn how to be the manager of your emotions, your energy and your stress level, so you get to decide how you feel and what effects you (and what not) on a day to day basis. You will learn how to protect your energy and yourself, so that others cannot steal your energy from you and you won't take over other people's energy or emotions that easily. You will also learn how to master your stress level, so you can avoid ending up in a burnout, this includes building your very own HSP Rescue & Emotions First Aid Kit to use in times of overwhelm. MORE BALANCE - Because you now have to tools to keep yourself in balance no matter what. From now on you are the manager of your life. MORE HAPPINESS & CONTROL- Because you our now in control of your emotions, your energy and your stress level and this will make you feel happier in your life. LESS STRESS - Because you now know how to protect your energy, how to avoid taking over emotions and how to release anything you might have picked up during the day that you don't want to keep. MORE ENERGY- Because you know know exactly what to do to protect your energy, so you won't feel exhausted or drained. And you have the tools you need to replnish your energy anytime you need to. HSP RESCUE & EMOTION FIRST AID KIT - You will have build the HSP Recue kit AND the Emotion First Aid Kit and they will help you with your emotions, energy and stress anytime you feel like you are loosing control, you are overwhelmed or just feel exhausted. The HSP Rescue Kit consists of all the tools any HSP should have to manage their energy and stress levels, so you will be the boss of your life. The Emotions First Aid Kit gives you everything you need to be the master of your emotions. Everything you need to protect your energy and emotions from outside influences combined with the knowledge of when to use which tool in which situation to effectively manage your energy, stress and emotions.